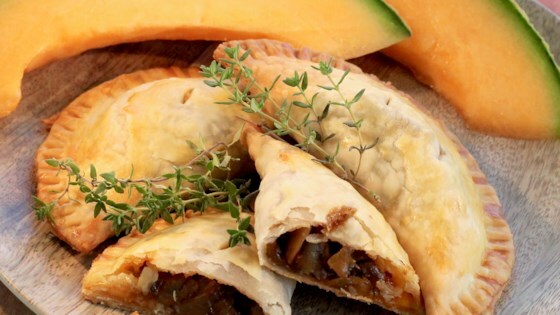 "Caramelizing the onions slowly results in the sweetest, most flavorful hand pie you've ever eaten. Don't expect leftovers, these will quickly disappear." Preheat the oven to 375 degrees F (190 degrees C). Line a baking sheet with parchment paper. Melt 1 tablespoon butter in a large skillet. Add mushrooms; saute until browned and tender, about 5 minutes. Remove from the skillet and set aside. Melt remaining butter in the same skillet over low heat. Stir in sliced onions. Cook onions, uncovered, until liquid evaporates and onions turn golden brown, 30 to 35 minutes. Stir occasionally so onions don't burn. Return mushrooms to the skillet. Stir in bacon, balsamic vinegar, maple syrup, thyme, salt, and pepper; cook for 3 minutes more. Set aside to cool slightly. Roll out pie crusts on a flat, lightly floured surface. Cut each crust into three 5-inch rounds. Whisk egg and milk together in a small bowl; brush lightly around the edge of each round. Divide the onion mixture evenly among the 6 rounds, placing it in the center. Top each with Gruyere cheese. Bring the sides of the dough to meet in the middle, forming a semi-circle shape. Press to seal and crimp the edges with a fork. Cut 2 small slits into each hand pie for steam to escape. Brush the top of the pies with the remaining egg wash if desired. Transfer pies to the prepared baking sheet. Bake in the preheated oven until cooked through and golden brown, about 20 minutes. Remove from the baking sheet and serve hot out of the oven or at room temperature. Feel free to substitute Swiss cheese for the Gruyere. Cheddar cheese works well too.